Maj. Mai Lee Eskelund, Stephen F. Austin State University assistant professor of military science, looks at class photos of the Women's Army Auxiliary Corps while Sophia Savage and Kierstin Smith, SFA students who created the "More Than a Riveter" exhibit, explain more of the WAACs history in Nacogdoches. Through SFA's Center for Regional Heritage Research, Savage and Smith created the historical exhibit, which is open through June 16 at the Nacogdoches Railroad Depot. NACOGDOCHES, Texas - Stephen F. Austin State University's Center for Regional Heritage Research's "More Than a Riveter" exhibit opened Thursday, April 26, at the Nacogdoches Railroad Depot. 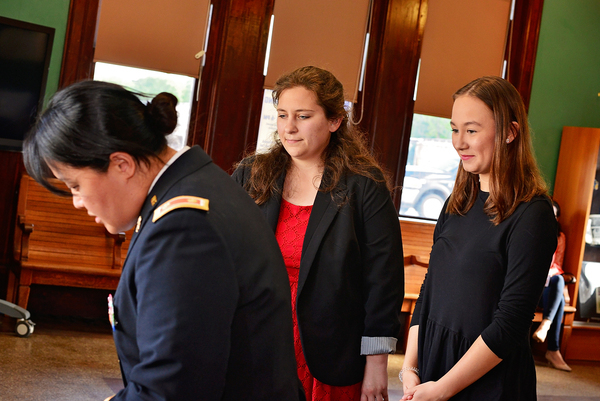 Sophia Savage, a counseling graduate student assistant for the CRHR, and Kierstin Smith, a DeWitt School of Nursing student, created the exhibit, which aims to preserve the history of the Women's Auxiliary Army Corps stationed in Nacogdoches during World War II. At the exhibit's opening, Savage and Smith discussed what they discovered while researching the WAACs and working with CRHR. "Before we started this project, I didn't think history was something I would ever be able to grasp, but after researching the WAACs and creating this exhibit, I realize that if you break history down into small pieces, you can see the full picture," Smith said. "I understand now why history and its preservation are so important." In addition to Savage and Smith, Maj. Mai Lee Eskelund, SFA assistant professor of military science, spoke about what it means to be a woman in the military. "These women who served in World War II paved the way for me to stand here today and tell you about my life," Eskelund said. "I wouldn't be able to serve my country if it weren't for them." The exhibit showcases numerous artifacts donated from collectors and museums throughout Texas. Artifacts include a WAAC uniform and scrapbook. Savage and Smith also created posters, an oral history video and two interactive kiosks. "More Than a Riveter" will continue through June 16. The depot is open from 10 a.m. to 2 p.m. Wednesday through Saturday, and admission is free. For more information on SFA's Center for Regional Heritage Research, visit http://www.sfasu.edu/heritagecenter/.